When Jim Anderton attended the Socialist Scholars Conference, held at Melbourne University High on July 18-21, 1991, he mixed with some highly influential activists. Themed on "Ecology, Socialism and Human Survival" the conference attracted around 800 activists and academics from Australia and abroad. According to Green Left Weekly No 21, 1991 "More than 100 people presented papers, films and workshops on a broad range of issues and ideas in left theory and politics: from Marxist economic theory to green politics to struggles in the Third World to attacks on civil liberties and the public sector in Australia. People came from 17 tertiary institutions, community media, trade unions, the environment movement, the Aboriginal community, Third World solidarity groups, progressive political parties and alliances and almost every social movement." A range of international activists presented papers, but the organisers were very disappointed that the now late Ernest Mandel, head of the Trotskyie "Fourth International" could not make it because of ill health. On a positive note "both Roem Topatimasang, international relations officer for the Front for the Defence of Human Rights and Ismail Momoniet, from the South African Communist Party, spoke optimistically of the rapidly developing movements for freedom and justice in their countries, stressing the importance of Australian solidarity in these struggles." Reporting on developments in the government, military, business community and the left in the Philippines today, the convener of the Union for Socialist Ideas and Action, Francisco Nemenzo, said politics in his country had been affected by both the crisis of capitalism and the crisis of Stalinism. Peter Camejo, former US Socialist Workers Party presidential candidate and recent US Greens candidate for the governorship of California was there. A self described "watermelon politician", green on the outside, red in the middle, Camejo spoke on using Green issues to effect socialist change. 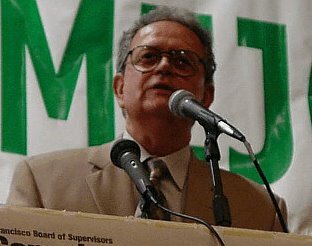 "Board member of the Environmental Federation of America Peter Camejo spoke of the need for a new approach to the ecological crisis among socialists...Camejo stressed the importance of socialists identifying strategic issues which offer long-term solutions to the social and ecological crises while having immediate possibilities for political action." Camejo also shared a stage with NZ greens leader, Jeanette Fitzsimons at the 1994 Green Left Conference in Sydney. Our man Jim said his piece"Jim Anderton, MP and leader of the New Labour Party in New Zealand, outlined the consequences of the introduction in the mid-1980s of a monetarist economic strategy bringing a massive rolling back of welfare provisions, extensive privatisation, an increasingly unjust taxation system and growing levels of unemployment and poverty." Political alliance forming was a major theme of the conference. The conference closed with a plenary session addressed by a panel of speakers on the subject ÂLeft politics: Where to now?Â. Including Joe Camilleri from the Rainbow Alliance, Louise Connor from the New Left Party, Ken Peak from the Australian Democrats, Reihana Mohideen from the Democratic Socialist Party and Ted Murphy from the Socialist Left faction of the ALP, this panel provided a forum to develop the presently limited dialogue between the main sections of the organised left in Australia. The panel was interesting and timely, with most speakers pointing to the unprecedented challenges and opportunities confronting socialists as the crises of international capitalism and the global environment worsen. The general mood of the discussion was encapsulated in a call by Mohideen to continue the dialogue within and between the socialist and environment movements regardless of political differences, to organise and unify wherever and whenever possible around specific campaigns and issues, and to build a genuine alternative which is based on the power of the people and grassroots democracy. I wonder if the NZ Greens, (Jeanette Fitzsimons, Keith Locke and Russell Norman), who have all had links with the conference organisors, the Democratic Socialist Party, would endorse such ideas?